100 year old egg is a Chinese delicacy and is made by preserving a duck egg in a mixture typically made up of clay, ash, salt, quicklime and rice hulls for a period of several weeks to several months. The result is an egg that is dark green/brown/grey in colour, is soft and gelatinous in texture and has an odour that slightly resembles sulphur. After reading this, you might not find the thought of a 100 year old egg appetitising, but I grew up eating the stuff and love it. 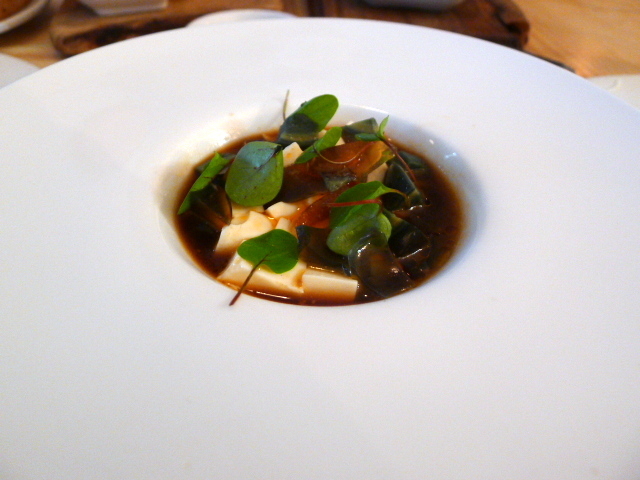 Here it had been chopped into small pieces and served with a sweet, chilli soya sauce and marinated silken tofu (£3.95) which was nicely done and well balanced in terms of sweetness and acidity. 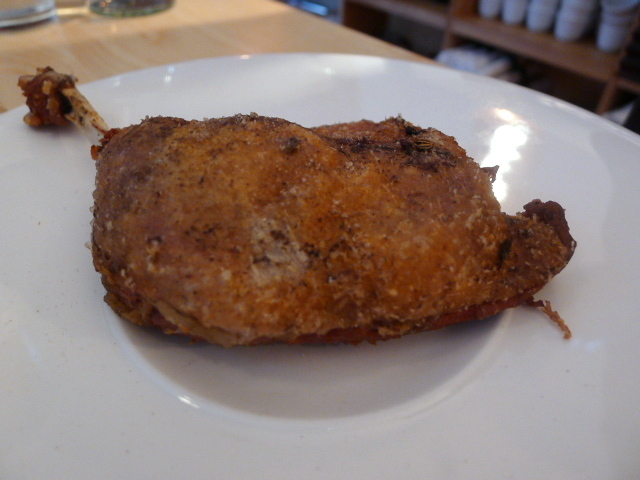 Crispy duck (£12.95) had a nice flaky, fall apart texture, and was served with some fine pancakes, vegetable condiments and a sweet plum sauce that worked really well together. This was a nicely executed dish. Abalone is a prized Chinese ingredient and so it was nice to see it on the menu at A Wong. 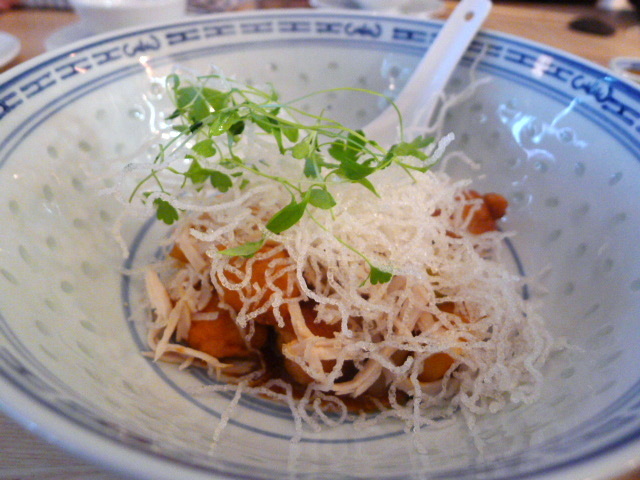 Here it had been braised with shitake mushrooms and abalone butter (£8) and was absolutely delicious. 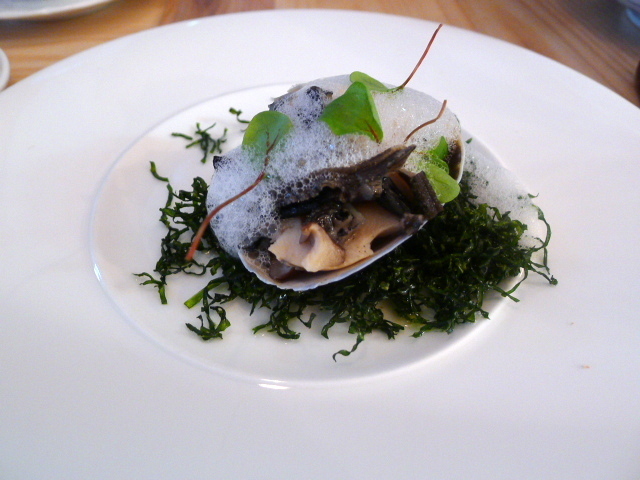 Overcooking can leave the abalone chewy, but here it was tender and flavoursome. This was a wonderful dish. 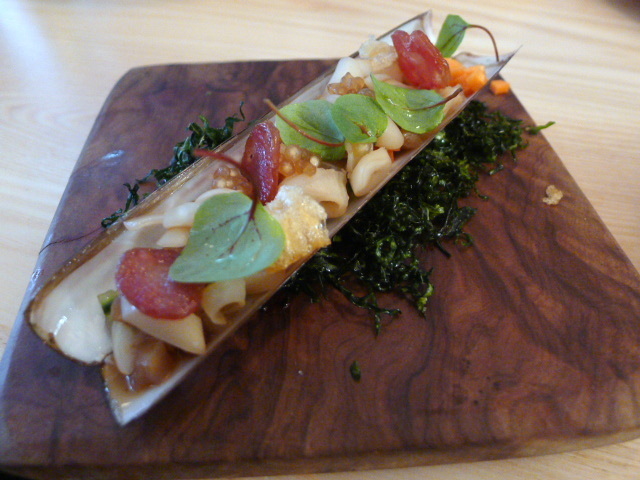 Razor clams with braised sea cucumber, pickled cucumber, and dried sausage (£5) was a little lacklustre. The choice of the combination of the ingredients was good, but the razor clams were a little chewy from overcooking, something easy to do as they had been cut so small. 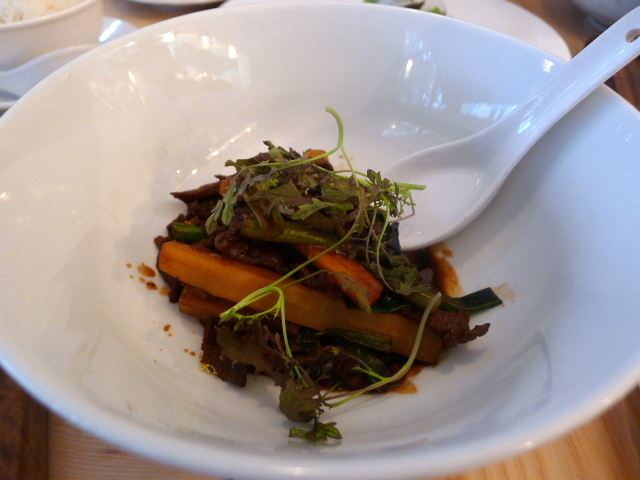 To main courses, and the beef in a dish of Scotch beef rump with ginger and oyster sauce (£7) proved to be rather bland and grainy in texture, the result of it being very thinly sliced and overcooked. But otherwise, the sauce was flavoursome and rich. Sweet and sour corn fed chicken (£6) boasted of a very well made sauce but the chicken was a disaster as it was extremely dry and very overcooked. 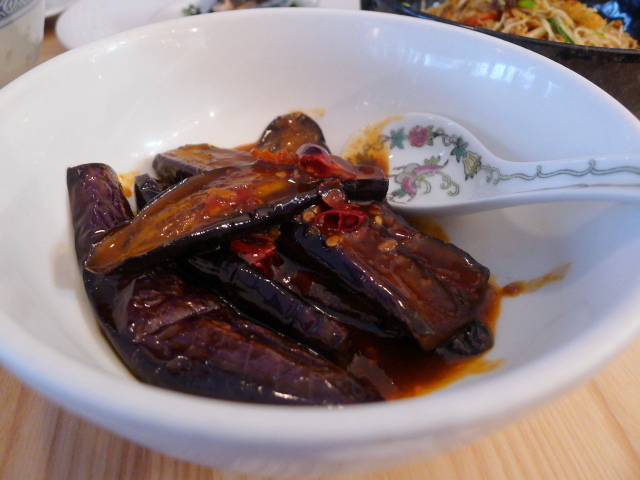 Sichuanese aubergine (£6) was delicious with a thick, sweet sauce. The aubergine was soft and gooey throughout and melded with the sauce nicely to make for something moreish. The Singapore noodles (£7) were excellent as there was a nice balance of pork, onions and peppers running throughout the dish. Also well judged was the use of curry powder, which is the requisite ingredient to make this dish work. 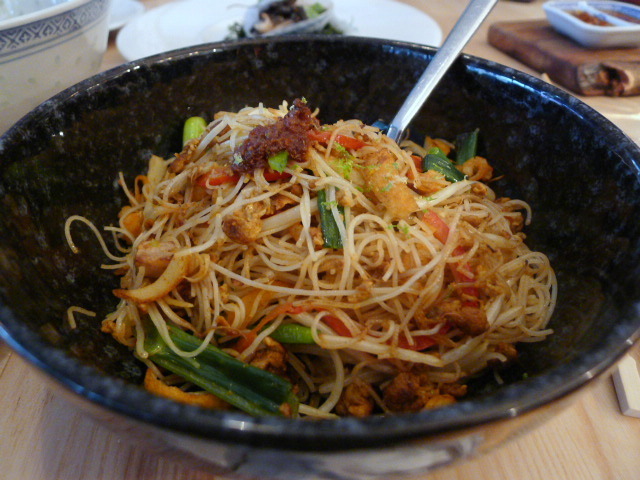 The noodles were well cooked and not overdone and still had a bit of a springy texture to them. 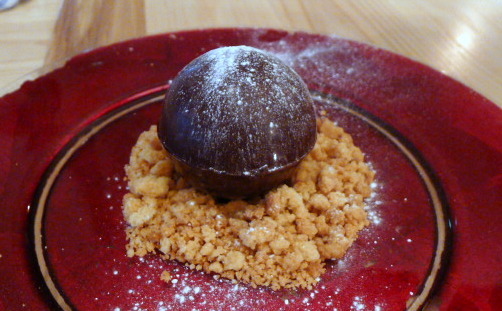 I adored the presentation of the chocolate ball (£6) served with a nut crumble and a soy caramel. 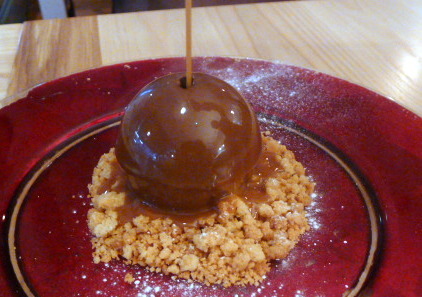 The ball dissolved when warm chocolate was poured over it to reveal a tobacco-smoked banana and orange centre with ice cream. 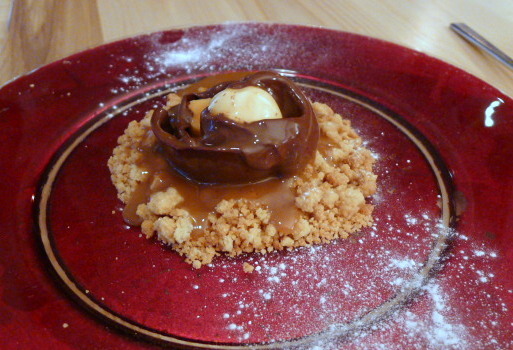 This was lusciously rich, and the nut crumble worked to great effect by giving the dessert a great textural contrast. You didn’t get much smokiness from the banana however, not that the dessert needed it, and a touch more ice cream would have worked better to cut through some of the richness. 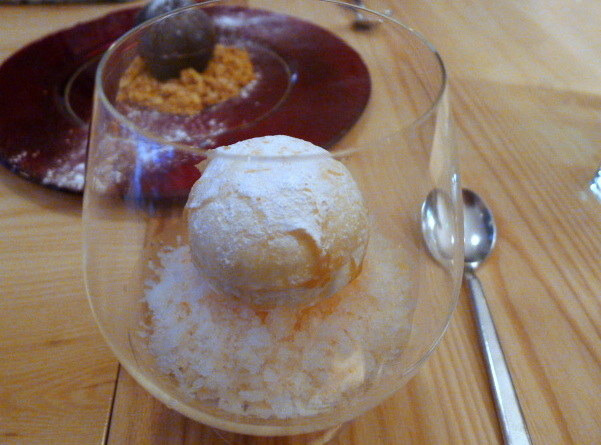 A snow ball meringue with lychee granite and lime sorbet (£6) was delicious. The meringue was light and airy, and the combination of the sweetness of the lychee and the acidity from the lime proved to a winning pairing. There was much to like about A Wong. The cooking showed solid, authentic technique, although at times some overcooking let the final results down. There was also diversity in the menu that was very appealing, and Chef Wong hasn’t shied away from using some of the more traditional Chinese ingredients. Furthermore, the food at A Wong did not contain any MSG, a definite bonus in my book as it didn’t leave you with that parched thirsty aftertaste in your mouth. The service was ok but the experience felt a little like the waiters were just plonking plates on our table. It was all a bit haphazard and could have done with some polishing. 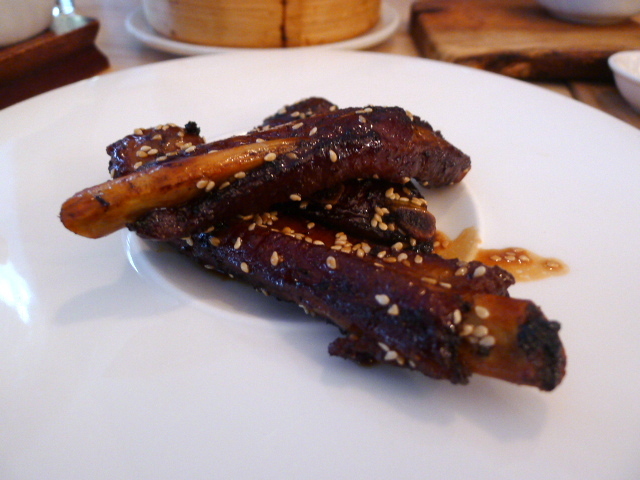 A Wong was a very good Chinese restaurant, and a very reasonably priced one at that. The food was satisfying and tasty, and the experience felt rewarding. There were some mistakes, and the service could be better, but at the end of the day, there was something for everyone. Food rating: 3.75/5 (I’ve marked it down due to some of the overcooking, but had it not been for that, it could have been a 4/5). Prices: About £30 to £40 a head. Excludes drinks and service.